Shoreditch is distinguished for being where the eccentric, idiosyncratic and downright bizarre assemble, and often build a business around their particular version of the offbeat. Throw some dreamily brewed coffee into the mix, and we can’t help but wear the peculiarity of our locality with pride: concept cafés and their quirks will always have a home here. 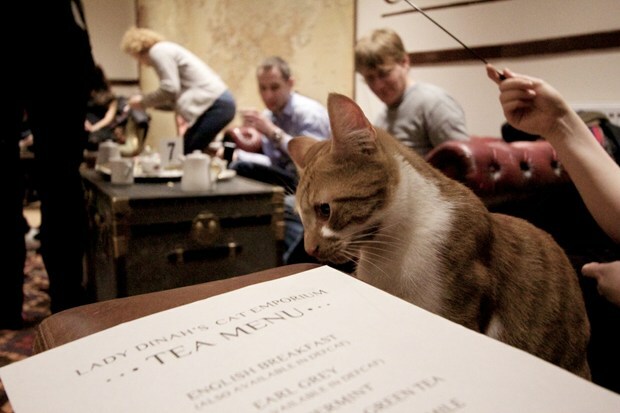 Lady Dinah's is home to rescued cats first and foremost, and café to humans second. Keeping the comfort of resident feline Mue (mother of Biscuit, Indiana, Romeo, Donnie, Artemis, Carbonelle and Petra who are also inhabitants), the twins Loki and Adamska, and adopted fellow Wookie in mind; the space is designed to allow these creatures of cosiness, stretching and snuggling to express the entire spectrum of their natural behaviours – an exercise wheel, scratch posts and pullback cars are all household staples at the emporium. Two legged mammals are welcome to take a seat (watch out for tails!) in the shabby chic surrounds and feel the warmth of tea drain through them, as they make some new furry friends. Oh and there’s a kitty themed shop where you can plant a Cheshire grin on your face by indulging in a cat face coin necklace, tights that are half cat silhouette and half sheer, or even a pet first aid course. Just pawfect! Rolling a double six with his Kickstarter campaign, founder Toby Hamand threw his dice well when he raised over twenty grand of moolah earlier this year to help open Board Game Café - Draughts. 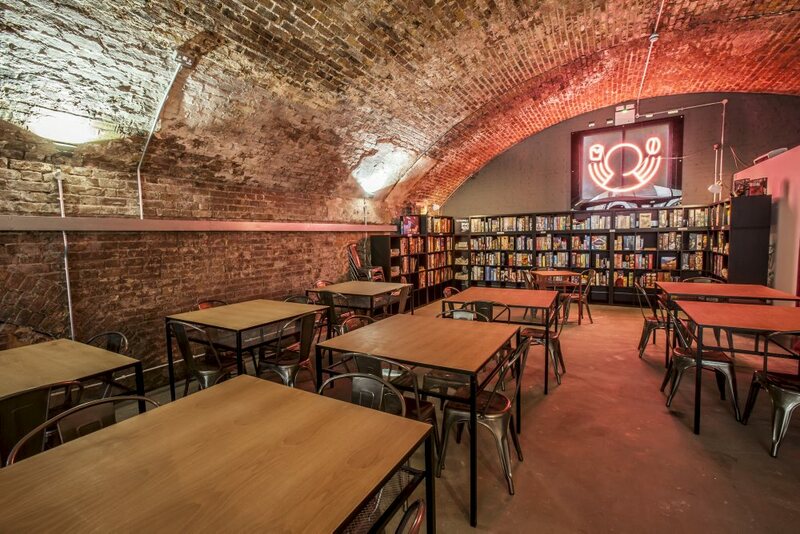 He first saw the concept over in Toronto and decided London needed to get on form; unveiling a late night den of board game playing, teaching and designing aptly named Draughts. Under the railway arches in Acton Mews a couple minutes for The Overground and Regent’s Canal, the venue’s beautiful curved roof, exposed brickwork walls and bright lighting provide just the right participatory space and competitive spirit to host tournies, social nights, designer workshops, prototype trials, speed dating and a shop that sells box upon box of fun. There's also an in-house library of over five hundred iconic household names, both modern and classic, climbing up the walls, waiting to be pulled out and bear witness to some terribly questionable tactics. Drop-ins are welcome to stay and play for a £5 cover charge while members and kids (little not big) pay the reduced price of £3.50. Quality sandwiches, snacks, salads and sweet cakes make up a high energy menu and local coffee, craft beers, ales, ciders and wines are on hand to ensure the mind is hydrated. You think turning up in jim jams to a trendy East London café isn’t appropriate? Well think again; adorning last year’s Crimbo slippers from nan while diving into a scrummy bowl of milky cereal at Shoreditch’s new Cereal Killer Café is probably the most suitable option. With a mind-blowing 120 types of cereal from all over the world to choose from, there’s no excuse for a boring breakfast ever again. 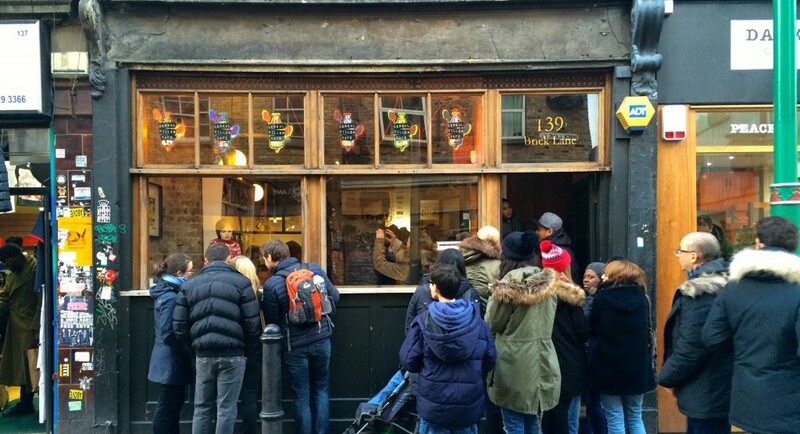 Sibling founders, Gary and Alan Keery, came up with the playfully named idea while craving cereal one hungover morning, and chose Brick Lane as the spot to bear witness to their drunken dream. Decorated with 80s and 90s memorabilia, the café is full of boyhood nostalgia and flashbacks of magical Saturday mornings spent watching cartoons while munching on spoonfuls of the super sweet stuff, which come with a choice of thirty different varieties of milk and twenty toppings. Since it’s opening it has unsurprisingly received a wave of press attention: while some critics simply don’t get why a person would want to spend £3.20 on a bowl of cereal, a different tune is tweeted against the foodie snobs by those who have travelled from the far reaches of London and beyond to sample this curated selection of crunchy exotic breakfasts. Everyday life in the city can sometimes become unimaginative, so picture stepping into a place where an idea conceived over a frothy cup of coffee can become a three-dimensional reality before your eyes. 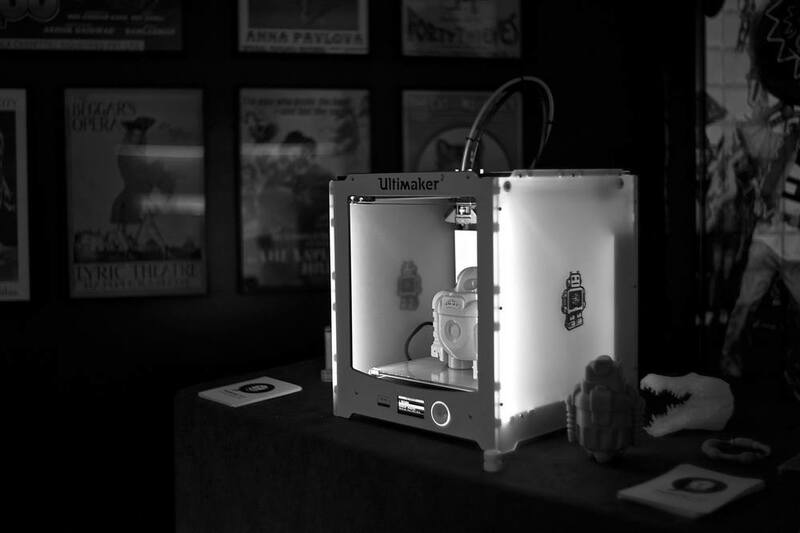 Placed on the corner of Shoreditch High Street and Kingsland Road, Makers Cafe introduces the newish technology of 3D printing (along with laser cutting and e-textiles) to the street. After much public interest but very little understanding of how it actually works, Maker Cafe founder, Soner Ozenc, decided to create a collaborative space where he could disillusion the magic of 3D printing to make it accessible for everyone; “Makers Cafe is all about digital manufacturing and it’s a good combination to be in the same space as coffee because coffee is all about people coming together, discussing ideas and creating a warm atmosphere.” Not only can patrons drink coffee from 3D printed cups as they sit underneath the light of 3D printed lampshades, they can also have their own concepts printed, layer by layer, for £1 per minute. Look out for regular workshops, socials and events at this steaming hot hub of innovation, interactivity and in-house manufacturing.